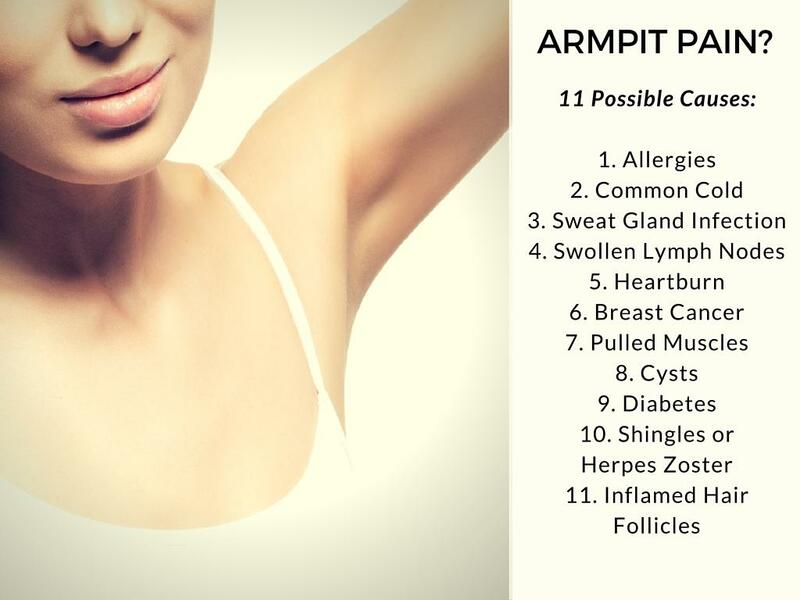 Armpit pain is annoying, and it can be scary. Whether it’s in your right or left armpit, pain can make it difficult to even scratch your head as you wonder what’s going on. It’s an unusual place for pain, after all. When it comes to armpit pain, men and women have different sets of concerns, none of which should be ignored. While underarm pain could be attributed to a bacterial infection, it could also signify something more severe, like cancer. Armpit muscle pain is also common, and can cause a sharp pain in the armpits. Another symptom that goes with armpit pain is a lump, which can also be confusing and painful. But lumps aren’t always a symptom, either; sometimes there’s armpit pain and no lump. Lymph nodes may also have something to do with armpit pain. Lymph nodes can become infected and enlarged, resulting in sensitivity and lumping in the underarm (1). Pain and infection may arise from blocked sweat glands, a bacterial infection, injury, or a nervous system disorder. It’s really surprising to see how so many symptoms and causes are related to underarm pain. If you’ve had some pain in your underarm, here’s what could be causing it. Allergies can be a major cause of armpit pain that you might be totally unaware of. Soaps, deodorants, antiperspirants and clothing are not only common, but required, so it might be strange to think they might be behind your armpit pain. If you’re allergic to some of the ingredients, chemicals, materials, or scents in these items, it can result in itchiness, rashes, and burning sensations. A number of allergies are misunderstood, so knowing what they are and how to treat them can help you stay healthy. Aches and pains are normal symptoms of the common cold or flu, and they can result in armpit pain; this is especially true if there is congestion or an upper reparatory infection. Symptoms will usually subside within a few days, and once the infection has left, the armpit pain should also subside. Lumps are a common symptom accompanying armpit pain, and they can appear if a sweat gland infection is present. They may also be accompanied by itchiness and redness. These infections can arise from poor hygiene, warm, moist conditions, and excessive sweating. They may even lead to boils and hard patches that give off blunt pain. Swollen lymph nodes can also cause armpit pain. Lymph nodes can become infected by bacteria, resulting in enlargement and swelling. The inflammation causes armpit pain, lumps, and is typically a reaction to a fungal, viral, or bacterial infection. Lymphadenitis can occur anywhere in the body, so the armpits can also be affected because of the concentration of lymph nodes in the area (2). Sharp pain in the armpits can be a result of heartburn. Also known as acid reflux, this is when some stomach acid travels up the stomach. It can cause pain in your torso as well as a sharp pain in the armpit. Women can experience armpit pain if they are dealing with breast cancer. Sometimes hardened spots near the breast can also be found in the underarm region. These lumps can result in armpit pain and should be examined by your doctor. Lymph node swelling is associated, but is not always a result of, cancer. A pulled muscle can cause severe armpit pain and is typically the result of a strained pectoral muscle. Although there is no armpit muscle, pain can occur there when other areas are injured. Pain can be sharp or dull, and will heal in time. These painful little lumps develop in the armpit because of its climate: it’s moist, dark, and warm, and provides a great setting for bacteria to fester. These little lumps are made up of fluids and other debris, and are largely harmless, but if left untreated, armpit pain can result. Most of the time, improved hygiene can take care of them, but it’s recommended that you see a doctor to make sure they’re not cancerous. Sharp pain in the armpits can occur from diabetes as a result of nerve damage. This is more likely if you’re not using treatment for your diabetes such as taking medication, improving your diet, and getting regular exercise. When diabetes is treated effectively, the risk for this type of armpit pain is greatly reduced. Shingles is a very painful condition that can affect older adults. It’s a viral infection that attacks your nerves and causes painful rashes, usually confined to one side of the body. Occurring on your right or left sides, armpit pain can be symptom. There are a number of natural remedies that can help treat shingles. Your armpit is home to a very high concentration of hair follicles that are prone to infection. The conditions of your armpit, as described earlier, is a prime location for infection and more often than not these infections can take place at the hair follicles. They can become clogged, along with the surrounding sweat glands, by debris such as dead skin, excess oil, and bacteria. These infections can be painful and irritating, but are usually easy to take care of by way of a good washing and continued proper hygiene. Once you’ve learned the cause of your armpit pain, you can begin treatment, and treatment will vary, depending on the cause. After all, treating pain resulting from diabetes, cysts, or a pulled muscle will all require different approaches. Sometimes—as with a pulled muscle—it’s more of a waiting game. But for some causes, typically those resulting in rashes or bacterial infections, there are quick ways to relieve pain, cure the condition, and likely prevent them in the future. You can offer some quick and soothing relief to armpit pain by applying a cold compress. Place an ice pack (wrapped in plastic to be discarded) or cold wash under your arm to reduce inflammation and itchiness and offer some pain relief. Be sure to wash the cloth after use in order to prevent the spread of bacteria. Sitting in a warm tub with a tablespoon of baking soda can also help neutralize armpit pain and discomfort. Doing this can help with itchiness, inflammation, and pain, and may possibly reduce visible lumps. Spicy foods can make you sweat, which is not a good thing if you’ve got irritated armpits. The additional sweat can further promote the growth of bacteria so the pain lingers or the condition worsens. If you have pain or a burning sensation in your armpits, try eating more fruits and vegetables, and avoid greasier foods and spicy items that can make you sweat. Making sure you properly wash your underarm area every day with soap and warm water is good way to prevent infection, pain, and inflammation. When armpits are kept dry and clean, there is a reduced chance of pain and irritation. If you have sweaty armpits and are concerned about aluminum in antiperspirants, applying some baby powder to the area after a shower or deodorant application can help reduce sweating. If you have swelling in your underarm, lumps, or pain resulting from a pulled muscle, a light massage can help relieve pain and inflammation in the area. Gently massage the affected area to improve circulation and limit swelling. Neutralize armpit pain by taking a warm bath. It might not always be bacterial, but most of the time armpit pain comes down to the simple fact that it’s a prime environment for infection. By staying clean and paying attention to the area, you can likely avoid infections, or quickly take care of any that arise. When the pain is accompanied by further symptoms, like lumps, it might be worthwhile to pay a visit to your doctor.